Well friends, the sun finally came out and though the temps were frigid (for Tennessee anyway), I managed to get some photos of my latest quilt finish. I love everything about this quilt. 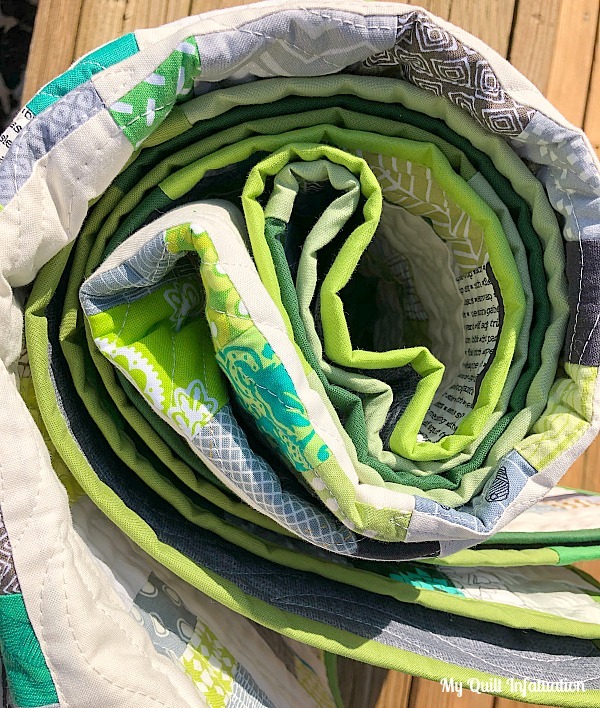 The gray and green scraps play so nicely together, and the simple pattern allows them to really shine without the quilt becoming too busy. Even though the greens are more prominent in the photos, in person, this quilt has an equal amount of gray that really soften it. The solid strips are Kona Bone, and the creamy color keeps the quilt feeling more natural than a stark white. I gave a sneak peek of the wood grain quilting at last week's NTT, and I am so excited to really show it off today. This is only the second time I've done wood grain quilting, and I am so pleased with the way it turned out. I love that the wood grain follows the vertical design of the pattern, and the soft wavy lines of the motif move so gracefully down the quilt. Best of all, it adds such fantastic texture. I quilted it with Aurifil 40 wt. #2311 (Muslin). I usually use 50 wt. for quilting, but the slightly thicker thread shows up really well. Even after finishing the top, I had plenty of green and gray scraps left, so I decided to go for the gusto and sew the rest of them up for the backing. I am happy to report that my green and gray jars are now completely empty. Woohoo! I widened out the improv strip on the back with a gray near-solid, and I love the way the scraps (and quilting!) really pop against it. Before I sewed up all of my greens, I pulled out just enough strips for a scrappy binding. 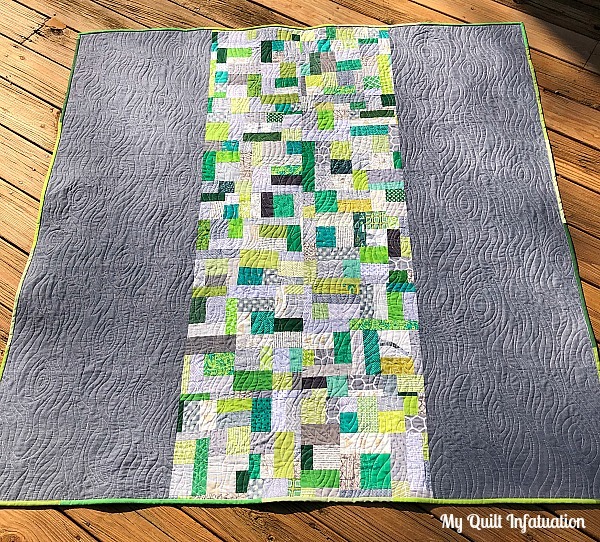 With shades of green and gray along with the wood grain quilting, this quilt feels a little outdoorsy, so I've decided to call it Woodwork. If you've vowed to empty your own scrap jars this year, structured improvisation is an easy and fun way to do it! Afraid of improv? My book, Stash Statement, gives three different methods for sewing your scraps together, along with twelve full quilt patterns that take the guesswork out for you. Once you learn the technique, you can apply it to any quilt pattern. It's easy peasy, and so versatile! 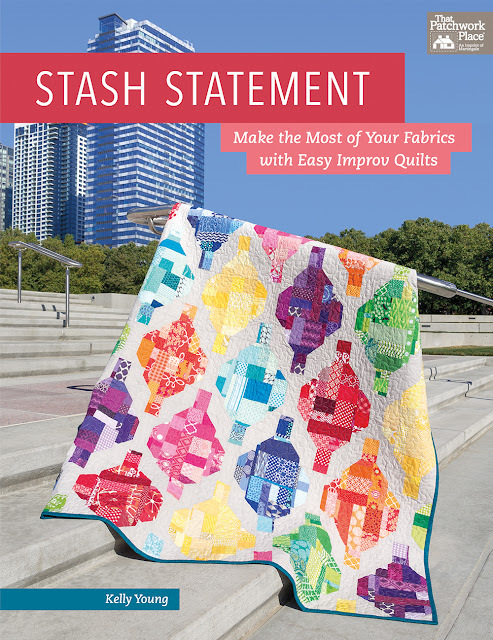 You can get a signed copy in my Etsy shop HERE, or find it on Amazon, Connecting Threads, or ask about it at your local quilt shop. The quilting is a fantastic choice to finish the quilt and it is beautiful on both sides; but I'm a sucker for how it looks on your gray backing! 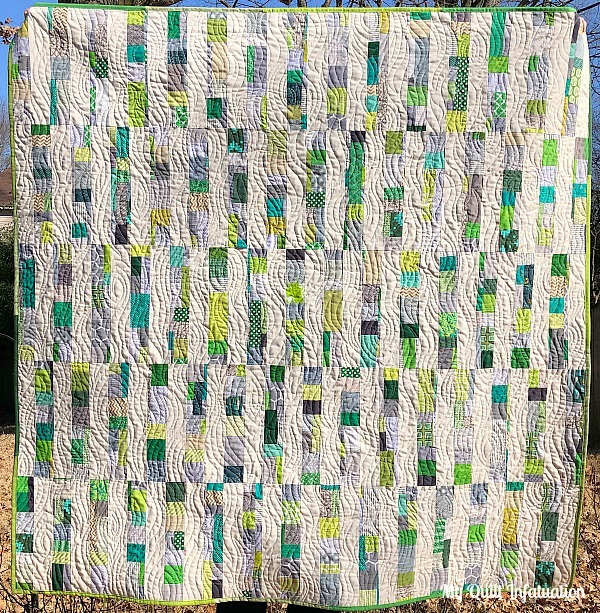 That's really pretty - I really like all the greens and grays and the beautiful quilting. What a beautiful quilt! 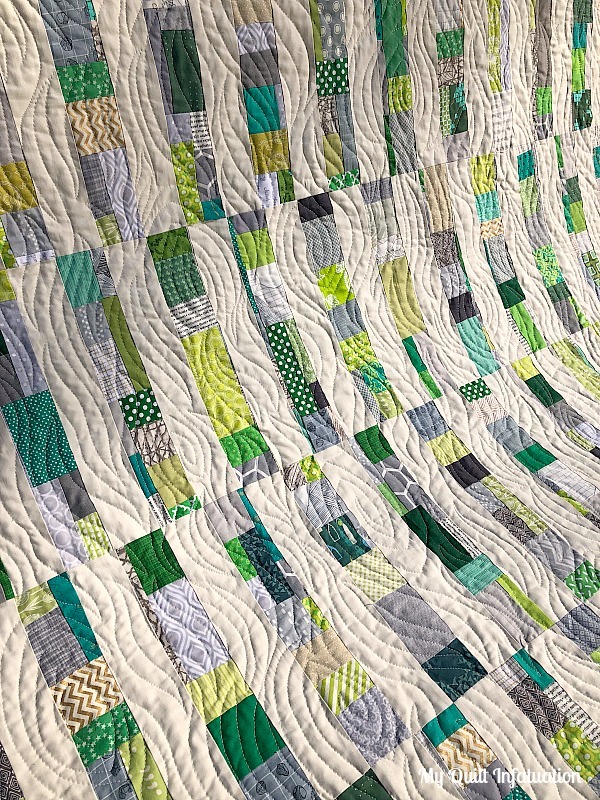 The greens and grays are so soothing, and the quilting pattern just really works! I love your scrappy back and how it just pops against that grey. Congrats! Such a great design and a super way to use up pretty scraps! This would look great in any size project from placemats to table runners to baby quilts to king size! You've got me wanting to dig through my scraps! This quilt is very appealing to me, I love the interplay of the quilting lines and scrap placement. Thanks for providing more ideas to me, a scrappy quilter. Oh my! It is GORGEOUS! I love the color scheme. I love the way it's so many different sizes of scraps used. Beautiful finish. :) Definitely worth the wait to see it in the sunshine. This quilt is lovely! 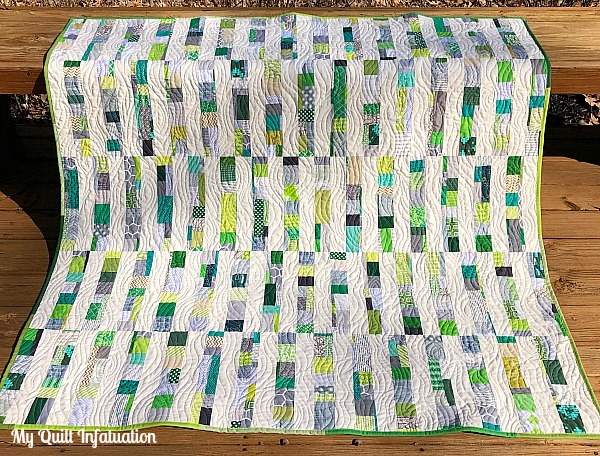 Don't know if it's the fabulously vibrant but limited colours or the inclusion of tiny bits that sets is apart from the usual scrap quilt, but it really works. Good job with the woodgrain, too. Love your finished quilt, it just sparkles! I'll be on the look out for your book too, I swear those scraps just multiply. A beautiful quilt. 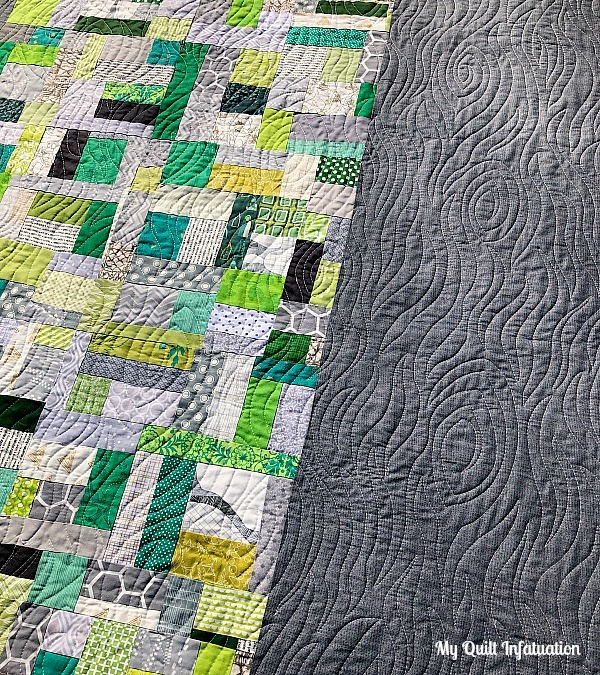 I love the way the green and grey play together and the quilting is wonderful. The photography is beautiful. I bought your book last year during the debut and must start working with it and my scraps. I always enjoy your creations and feel so inspired. This is a beautiful quilt. The greens and grays are a perfect choice together. I love the back, gives you a two quit for one project. Just lovely! Never thought about using greens & grays - and I like it!!!! Says Spring to me! Beautiful quilt and I love the wood grain quilting pattern!